I get lots of questions as to when to prepare the garden and plant certain things. Through my own experience and research I came up with this month by month gardening schedule! Planting times and outdoor chores are subject to change due to weather. Each month is an approximate 4 week month, days and times may vary. List is subject to change depending on what I do in the garden, but here are the basics. Week 2 - Order seed catalog’s and get your seeds ordered for the year. Weeks 3-4 – Start perennial herbs indoors. Week 4 – Sharpen pruning tools. 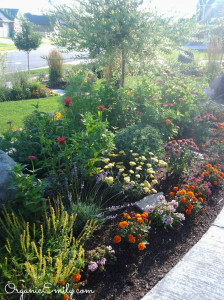 Prune trees and non- flowering shrubs while dormant or sign up for a free class in March at the Conservation Garden Park in West Jordan UT. Begin yard clean up of any debris. Week 1 – Start cauliflower and lettuce seeds indoors. Start tomatoes and peppers indoors if planning to place under walls of water mid April ( in 6 weeks). Week 2 – Apply dormant oil to fruit trees if using. Continue yard clean up and apply a top cover of compost, 3-4 inches in all beds. Prepare garden beds by gently mixing organic compost and organic fertilizer into vegetable beds. Start planting Group A Hardy Plants (see list below) from seeds or starts outside as soon as soil can be worked (can be moist,but not wet). Week 3 – Bare root fruit trees and shrubs become available at local nurseries. Week 4 – Start tomato and pepper seeds indoors if planning to put outside mid May ( in 6 weeks). Week 1 – Start planting Semi-Hardy Plants from Group B including perennial herbs (see list below). Apply pre-emergent to turf grass to control annual weeds if using. Week 2 – Cold tolerant flowers like pansies become available to plant at all nurseries. Prune shrubs that bloom after June. Week 3 – Harden off tomato seedlings by exposing them to 40`-50` F for 3 hrs per day this week. Start melons, cucumber and squash indoors if desired. Week 4 – Transplant tomato and seedlings under walls of water. Aerate turf grass. Prune roses. Plant dahlia and gladiolus bulbs outside. Week 1 – Depending on the weather, water lawn and beds 1/2 – 1 inch per week. Harden off tomato seedlings by exposing them to 40`-50` F for 3 hours every day this week. Fertilize lawn with organic fertilizer. Check sprinkler heads and check for adequate water coverage. Week 2 – Start planting Tender Vegetables in Group C (see list below), including tomatoes. Check USU Pest Advisory to get a head start on controlling garden pests. Plant warm weather annual flowers. Enjoy the harvest of fresh spinach, lettuce, kale and other leafy greens from the garden. Week 3 – Prune spring blooming shrubs after they finish blooming. Plant Very Tender Vegetables Group D from seeds outside. Week 4 – Plant Very Tender Vegetables Group D from starts (see list below). Apply chelated iron to plants suffering form iron chlorosis like strawberries, raspberries and roses. Week 1 – Water lawn and beds 1-1 1/2 inches per week. Spray fruit trees if choosing to keep the pests away. Week 2 – Continue harvesting leafy greens, peas and herbs from the garden. Week 3 – Fertilize vegetables and flowers with a good organic fertilizer like fish emulsion. Check to see of soil is getting watered down 4-6 inches with a garden spade. Week 4 – Continue harvest of veggies and herbs. Build compost for garden. Start broccoli and leek seeds indoors for a fall crop. Week 1 – Water lawn and beds 1 1/2 – 2 inches per week. If you planted tomatoes in walls of water enjoy the first harvest by July 4th! Week 2 – Fertilize annual flowers and veggies, especially potatoes and corn. Dead head perennials and annuals if needed. Week 3 – Harvest potatoes if the tops begin to die back so you can use the bed for a fall crop. Week 4 – Start planting Cold Crops Group E for fall. Add more compost and fertilizer to soil before planting. Week 1- Water lawn and beds 1 1/2 – 2 inches per week. Go to your local Farmers Market. Week 2 – Harvest garlic bulbs. Make a plan for what you want to preserve for food storage for the year. Week 3 – Fertilize flowers, fruits and veggies. Apply more chelated iron to raspberries if needed. Harvest onions. Week 4 – Preserve your harvest through canning, drying or freezing. Visit your local Farmer’s Market. Week 1 – Water lawn and beds 1-1 1/2 inches per week. Learn how to save seeds. Week 2 – Plant trees and shrubs if adding to your landscape. Fertilize lawn. Visit your local Farmer’s Market. Week 3 – Fall bulbs become available at local nurseries. Shop for late season perennials on sale. Week 4 – Harvest potatoes if you haven’t already. Enjoy the last of the tender veggies before it freezes. Plant green cover crops (legumes) to enhance soil for next year. Week 1 – Water lawn and beds 1/2 – 1 inch per week. Week 2 – Divide and transplant spring and summer blooming perennials. Plant fall bulbs if you haven’t already. Deeply water all evergreen trees and shrubs to prevent winter injury. Week 3 – Winterize sprinkler system. Cover fall crop vegetables before hard freeze if using hoop houses or cold frames. Week 4 – Clean out annuals and dead perennials. Fertilize lawn one last time for healthy spring lawn. Week 1 – Clean and prepare garden tools for a winter. Week 2 – Clean up any excess leaves or debris to keep the pests from wintering over. Week 3-4 – Enjoy the beginning of the holidays! Happy Thanksgiving! try cooking up some fresh sage, thyme and onions sauteing in butter! Basting the turkey or making stuffing with it! Oh I love the holidays! Happy Christmas! Give dried herbs in cute glass jars or other yummy homemade garden gifts to neighbors for Christmas!